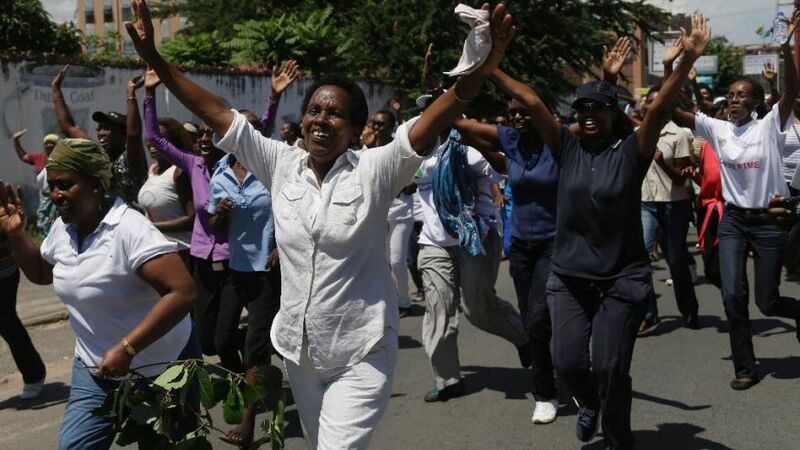 On Mother’s Day the women of Burundi took to the streets. Recent weeks have brought conflict onto these very streets – protesters, police, tear gas, water cannons and even live ammunition – and dead sons. The president continues to push for an unconstitutional third term that will break the Arusha Accords peace agreement and possibly ignite another season of ethnic violence. Meanwhile, the economy crumbles. The most vulnerable ones feel the insecurity first, the economic loss first, the pangs and cost of violence first. So on a quiet Sunday morning 300+ women walked the winding roads of Bujumbura right into the heart of the city. They prayed with their feet. They sang. They danced. They defied the no-protest order issued by the government just the day before. They sang “Jesus is the Savior” – their inflection clearly stating the current president was not the savior of this land. They reminded me of the early Church declaring “Jesus is Lord” – and Caesar is not. They refused to be silenced with each step and every song. Undeterred the women marched to the city center – the first protesters yet to reach this symbolic location. At the heart of the city stood the women in peaceful opposition to the violence of previous days. They sang the National Anthem declaring their love for their people and their homeland. On Mother’s Day the women of Burundi marched for peace – and showed the truth of motherhood. These women – mothers, aunties, sisters and daughters – rallied. They came out to stand for all the futures to be had in Burundi for all the sons and daughters of all the neighborhoods and provinces across this land. They did not only march for their child – but for everyone’s children. These women know that every neighborhood must be bound by peace and rid of violence (including the predatory economic kind). They know as long as some sons are shot, all sons live in peril. They know that when certain streets are blockaded, no one has the freedom of movement. They know when one hundred policemen demolish a neighborhood with their weapons and bullets; no other neighborhood can claim safety. And how deeply they know that when one pregnant woman is dragged from her home and through dirt roads threatening her life – no mother walks free from fear. The women of Burundi mothered as they marched. They mothered a hurting city as they came alongside and offered a healing balm. They mothered as they advocated for the weak and wounded and still incarcerated ones. They mothered when they refused to be intimidated or silenced or stopped. They mothered as they sang songs to awaken hope. These women showed me a mothering wide enough to embrace a nation. They taught me that motherhood isn’t just about my children, but all our children together and all their futures. Today I honor these women. Today I want to be a Burundian mother. Astounding! Beautiful piece, beautiful protest, beautiful women. And you are a Burundian mother. Yes, you are. ” (Why does Pharaoh always underestimate the women? )” This just brings an ear to ear grin on my face. These amazing women said yes to God and will change the ways of their country !!!!! I love this with my whole heart! When I say “be the church” this is what I’m talking about. Peace and love to the marching mothers in Burundi, I pray we might all embody the spirit of their motherly strength. Thank you for writing this beautiful piece. I love every word you wrote here and felt fire in my heart, a call to move as I mother. These are the bravest ones of us. These mothers make me weep with hope and joy! I love this! I am touched and inspired by these women. Perhaps it’s time for all mothers to unite in loving protest against senseless killings of both young black men and police officers.